Launched in 2015, the GEI is an ambitious international campaign to enable us to open the doors of our education programmes to 250,000 refugees each year by 2020. Education is a life-saving intervention. Yet, among refugee children, only 61 percent are enrolled in primary school, 23 percent are enrolled in secondary school, and just one percent are enrolled in tertiary education. Rooted in a strong tradition of Jesuit education, JRS is committed to a five-year effort called the Global Education Initiative (GEI) to expand and strengthen our educational services. Launched in 2015, the GEI is an ambitious international campaign to enable us to open the doors of our education programs to 250,000 refuge each year by 2020. Our education programmes cover pre-primary, primary, secondary and tertiary education, informal and supplemental education, livelihoods and skill-building education, and teacher training programs. We are committed to ensuring quality learning opportunities for all. 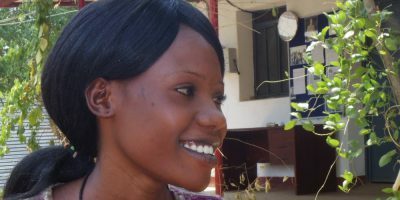 Our commitments include expanding initiatives promoting girls’ educational access and wellbeing in Malawi, Chad, and Afghanistan, mainstreaming mental health/psychosocial services and promoting social and emotional learning in its education programmes, and expanding programming to support teachers to become certified. To give a child a seat at school is the finest gift you can give. Teacher Development – Inspired by the Jesuit tradition of Ignatian pedagogy, JRS emphasises the role of the teacher as a transformative educator who can provide more than just quality instruction. Teachers can create the kinds of inclusive environments where children feel safe to learn, reflect on their experiences, and develop their potential. Enhancing Access to Secondary Education, with a focus on girls – Displaced children are at a disadvantage: fewer than 23% are able to access secondary education. Of this already small group, fewer than 30% of are girls. 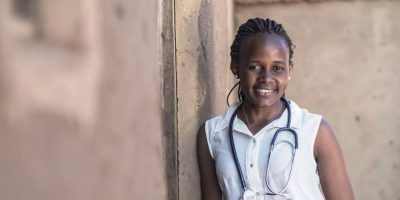 JRS recognises this disparity, and offers focused programmes that support girls as they progress throughout primary school and transition to secondary education. 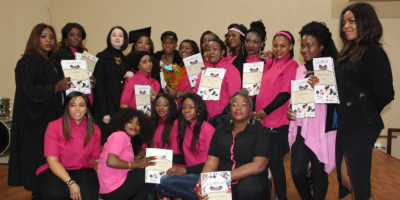 Professional and Post-Secondary Education – JRS also offers programmes that promote educational and professional goals for youth and adults. This can include language courses and professional skills trainings to promote sustainable livelihoods. 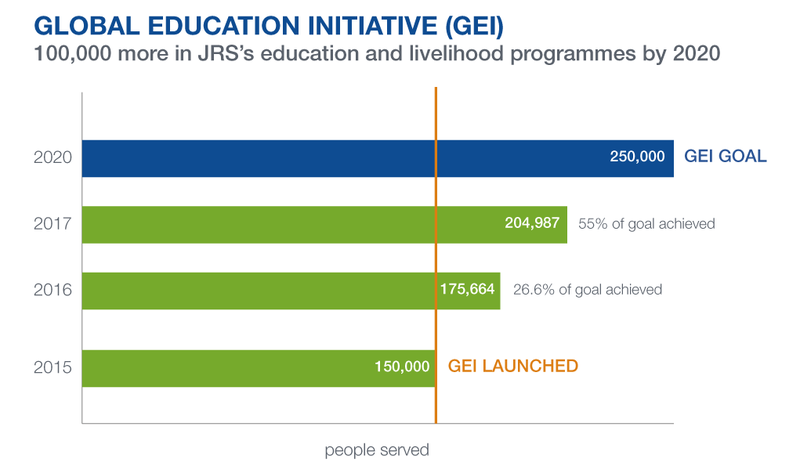 Two years into the five-year campaign, JRS is well on its way to a successful GEI. The number of children and adults enrolled in JRS’s education and livelihoods training courses has increased by 54,987 after two years, more than half our stated goal. 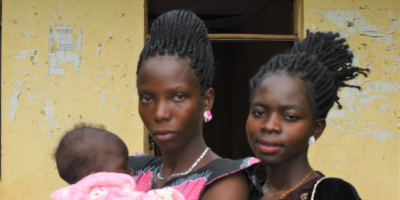 Significant new education initiatives for girls have been started in Chad and Malawi. 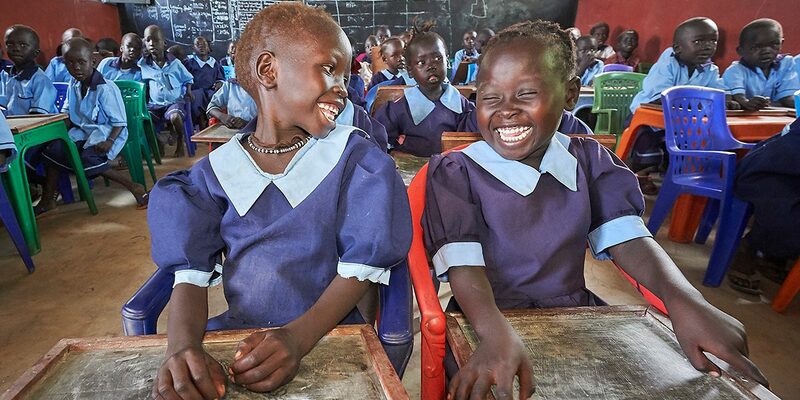 In Kenya’s Kakuma refugee camp, a special needs education project is underway. A global Teacher Training Programme has been designed and is being implemented in Africa and Asia. JRS’s post-secondary education programmes are being refocused through needs assessments and market analyses.